Paramnesia started up back in 2005, but were relatively unheard of due to them not releasing any sort of material until 2013. Once their 2013 demo hit, they were picked up by a French label and have released a split release and their debut self-titled full length. 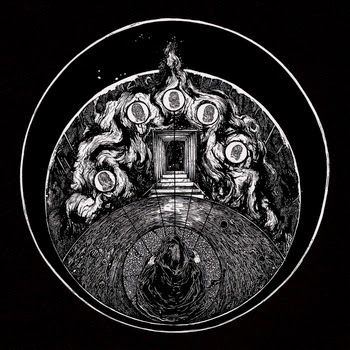 Sporting only two tracks but adding up to be over 40 minutes long, Paramnesia plays an extremely dark and cold version of atmospheric black metal. The album has the sound quality of a demo release, which works in this case because it brings the music to an old school black metal feel. The first track starts out with a haunting piano intro that quickly bursts into a murky mix of blasting drums, down-tuned guitars and tortured screams. Throughout the music, there are softer sections where the music is broken up by clean and gentle guitars but even within those parts, there is an extremely scary feel. What is disappointing is that the scariness goes away after a bit because you know exactly what’s coming next. The tone of the music does not change itself up very often and it all sounds pretty similar. While yes, it is one solid track but if that track is over 20 minutes long, there should be some recognizable differences throughout. The drummer on this album is extremely well talented. From the sounds of some of the fills, I would not doubt that he has a bit of classical training or is influenced by a more classical genre of music. While yes, the drums are for the most part going crazy and providing a solid wall of sound for everything else to build around, the way the fills are structured take a more classical approach. The guitars, on the other hand, are downright dirty and raw. Within the clean sections of the songs, the tone is quite good but once the distorted guitars kick in (which is what is being heard 98% of the time) there is a muddy overtone that after a while, you can’t help but ignore. The vocals are eerie and quite disturbing. There is no chance of understanding what he is saying because they are recorded so raw. In a twisted way, they sound like torture victims’ screams, which gives the music a whole new feel of creepy. Paramnesia has some work ahead of them to improve their writing and diversity within a genre that is becoming somewhat stale. Being diverse and sticking out is what you need to do to be recognized these days and I am not too sure they are there yet. However, their unique take on vocals and the creepy factor they add to the music is un-deniable and that is something I love.